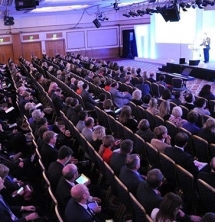 A record number of school and college leaders gathered in March for the 2014 ASCL Annual Conference, to debate, network and learn about the latest developments in education policy. We were delighted that more than 1,200 of you could join us at the Hilton Birmingham Metropole for what truly was an inspirational and amazing couple of days. Welcoming delegates to the conference, ASCL President, Ian Bauckham, said it has been a momentous year for ASCL as membership had grown to more than 18,000 members – nearly double what it was a decade ago – and that it is continuing to expand at an unprecedented rate. On the conference theme, ‘Values for Learning and Leadership’, Ian said he was inspired by teenager Malala Yousafzai who risked her own life to fight for the values of education for all. Ian (pictured right) also talked about the 2012 Programme for International Assessment (PISA) results and said, “I know PISA is not everyone’s favourite” but that we need to look at what it is that the most successful countries do that makes them so successful. He then talked about why he believes “we should welcome the new College of Teaching” but stressed that it should be “a voluntary, profession-led, membership body, which puts professional development at the top of the agenda and links it with increasing professional effectiveness”. Next on stage was Secretary of State for Education, Michael Gove, in a question and answer (Q&A) session. He said that Ofsted and the government can now take a step back from intervening with successful schools and he stated that schools were ready to take on this autonomy. Michael Gove was asked several challenging questions from the floor, including a question that asked for reassurance that fair funding was on its way. Mr Gove responded by admitting that not enough had been done but reiterated that the government is taking a step in the right direction by putting additional money into the lowest funded schools. On another funding-related question, Mr Gove (above) was asked about post-16 funding cuts and he replied by saying that the government “had promised to protect funding for 5-15 year-olds and that it was a choice between cuts for early years or post-16 – one or the other had to take a hit”. He was also asked whether, in light of the short tenure of many school leaders who took on challenging schools, as a result of Ofsted outcomes, he would advise school leaders to do the same today. Michael Gove replied by saying that the government and Ofsted would work with heads in challenging schools and give them more space and time to turn things around. In addition, Sir Michael responded to ASCL’s position paper on inspection (see the position paper online at www.ascl.org.uk/futureofinspection) where he made a commitment to review the inspection of schools graded in their last inspections as ‘requiring improvement’ with new or relatively new leadership. Following that commitment, he has since sent ASCL General Secretary, Brian Lightman, a letter highlighting that new headteachers of these schools will be given time to improve their schools before being inspected (see the letter online: www.ascl.org.uk/letterWilshaw). Sir Michael also said, “Inspections are necessarily tough and demanding and that if they weren’t, they would lose credibility.” He added, “Publicly funded schools should be accountable to one inspectorate and it would be wrong to suggest otherwise.” He said, “There is little evidence to suggest that misjudgements have increased.” However, feedback received from members to ASCL strongly disagrees with this. In addition, in his speech Brian called on the government to respond to the many unanswered questions that urgently need clarifying. He said that poor planning and delay over changes to qualifications and other reforms will lead to three years of turmoil for students and teachers. Many of you have already been asking us when we are holding the conference next year – it’s taking place on 20-21 March at the Hilton London Metropole Hotel. Whether you are a first-time attendee, a day delegate or coming with your whole leadership team, you will find something to engage and inspire you – so put the dates in your diary.